Some bathroom remodeling projects opt to leave out a vanity, but for many people a vanity is central to solving their bathroom storage concerns. It provides valuable space to organize those items you want hidden away, and the countertop provides space to set out items you require to hand. The vanity also helps define your bathroom design, as these treasure troves of storage come in an array of styles to suit any home décor. With so many options available, how do you go about selecting the right one? Start with our practical design tips here, and then find a vanity with the style, shape, and finish to fit your new bathroom design. If storage is not an issue, then any style vanity will work. 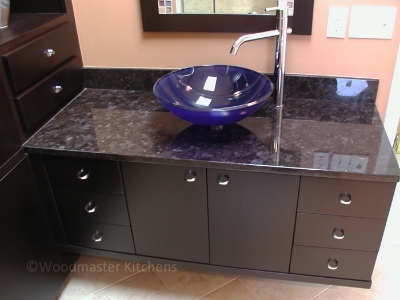 If you need to reduce clutter then find a vanity that will maximize available storage space. These requirements are individual to each bathroom within a household. A guest bathroom or powder room, for example, will not require the same storage as a master or kids’ bath. Review the items you regularly house in the bathroom, and decide which ones require vanity space. If you have available space, it is wise to allow for a bit of extra storage. Make note of which items you plan to store in the vanity and include specialized accessories to accommodate these items. You may even include electricity inside the vanity to allow easy storage and use of electronics. No matter how much storage you want, you are limited by the size of your bathroom. Too large a vanity will only overpower the room and interfere with use of the space. If floorspace is at a premium, consider supplementing with wall cabinets, a tower cabinet, or small extra cabinets that rest on the countertop. How tall are the people using the vanity? 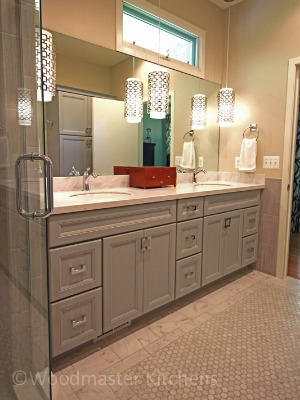 Vanities are not one size fits all, but can be customized to fit your needs. In addition to floorspace, consider the height of people who will be using the vanity. According to the National Kitchen and Bath Association, vanities can range in height from about 32” up to 43”, and best practice is to match the height to the requirements of the users. What is the layout of your bathroom? When planning where to put your vanity cabinet, examine the positioning of other items you will include in the room. Position your vanity where it will not impede the flow of traffic, and where you have ample space to open doors and drawers. Make sure there is plenty of space for activities like shaving and applying make-up, as well as a place to hang a mirror above the vanity. Since cleaning can be a challenge, take into account how easy it will be to access the areas around the cabinet when cleaning. Finally, look at the positioning of existing plumbing when determining where to put the cabinet. If you want to move the vanity away from existing plumbing, be prepared to include more in your budget for the extra work involved. A larger vanity with two sinks, combines sleek lines and a gray color scheme to create the perfect addition to this contemporary bathroom design. A vanity in warm wood tones fits this traditional bathroom style, and provides ample storage and counter space. Custom vanities can provide personalized storage but also unique design details such as the x-molding design on the side of the cabinet. Supplementing the vanity with another make-up vanity cabinet provides a designated space to apply make-up and get ready for the day. For a modern take, a floating vanity with clean lines is the perfect addition. Whatever your requirements, there is a bathroom vanity to suit your needs. For more bathroom ideas, visit our design gallery or contact us for more information.